I really liked this match up, he was pretty slow moving and had virtually no shooting. Additionally, his magic doesn’t really threaten the fliers and pyro was going to have a field day. 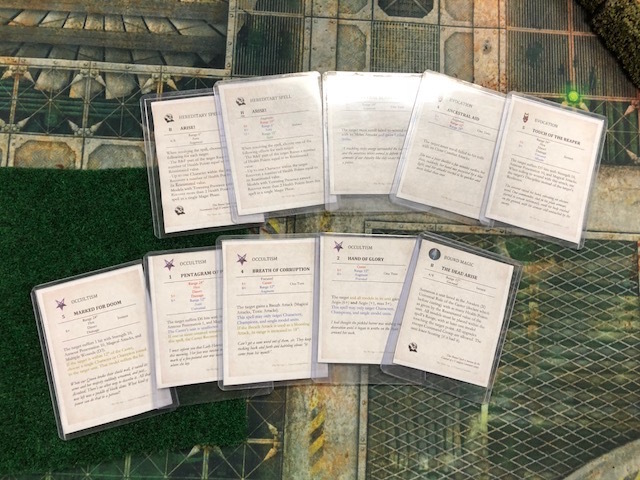 One risk, was that we had capture the flags and my QG units are a real liability in that mission. 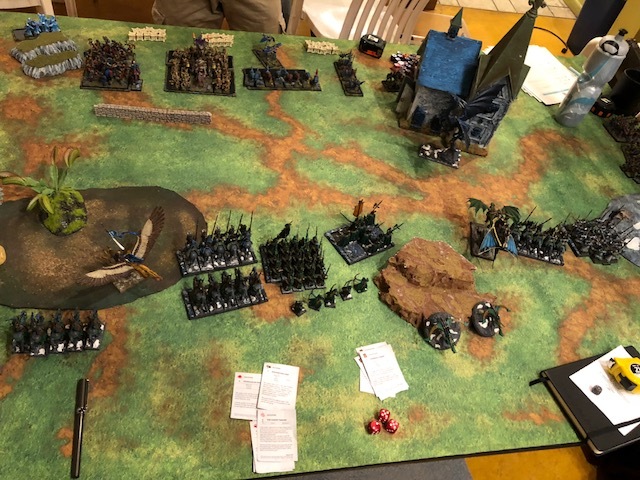 I spent the first 3 turns getting my dragon mage/Ryma around his left flank (my right) and my griffon prince around his right flank (my left) and taking off his acolytes/repeater crossbows. The dragon mage and Ryma Knights combined with the blue spears manage to take out the two spear blocks on my right. Despite trying all game, Ben failed to take off either QG unit, between bad casting/wounding rolls and my hereditary he just couldn’t get wounds through. 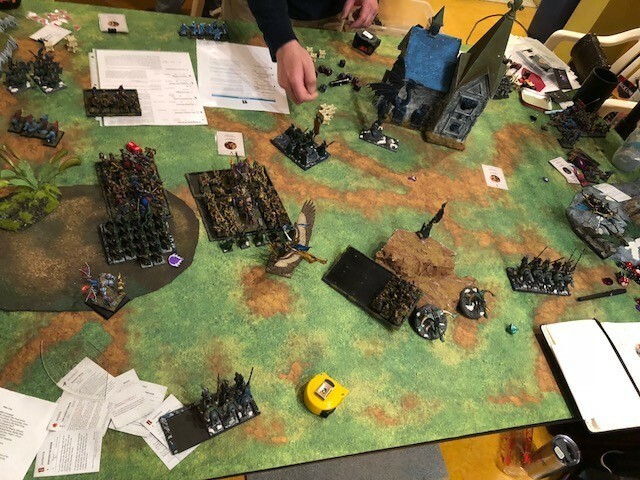 Ben had some bad luck he really didn’t need when 4 single bolts from by bolt throwers all hit (admittedly in half range) all wounded and he failed all his ward saves to lose the altar BSB in Turn 5. 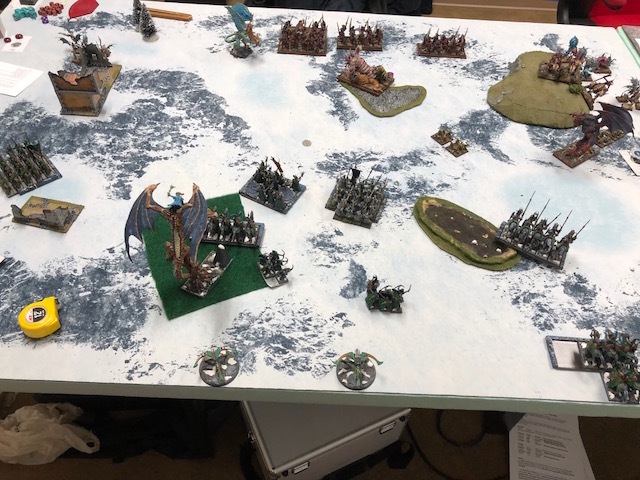 I had some bad luck to help ben out and my green spears on my left failed a terror check from a kraken charge and fled off the board, then the Flame Wardens counter charge failed to kill the kraken in 3 rounds of combat (it had only 4 wounds left at the beginning of combat, so this should have happened). 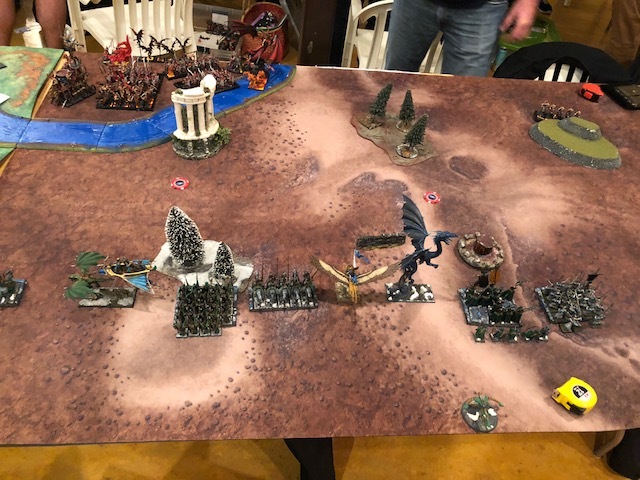 Ben’s tower guard and krakens were untouched, which was a lot of points, but he’d only managed to get one spear unit and one reaver unit so I was up big with the objective for a 17-3 for the Sea Dragon Host. So it’s been a couple of months since this tournament and I already have bat reps stacked up for the US Masters event so I’m going to push out bat reps 3 and 4 pretty quickly here from Pacific Rim tournament. Well start out with game 3 and we were up against the team who flew out from Colorado. 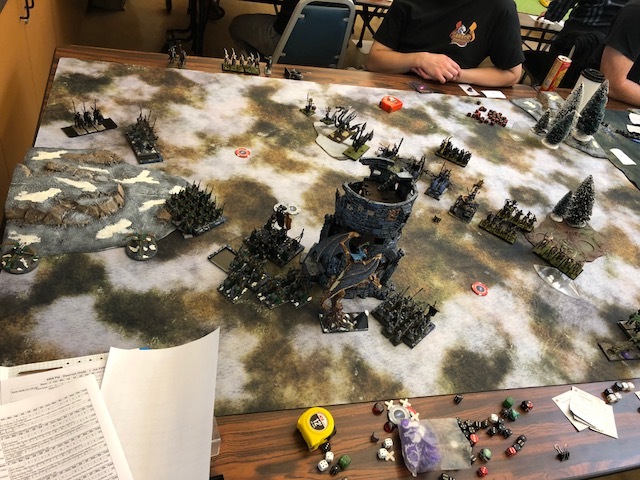 There was really only one red match up for me (Karen’s Dwarves) so we dropped me first and I got the dwarves and Mike’s VC. We clearly chose for me to play against Mike. I’d met Mike a number of times at tournaments over the years and am a huge fan of his channel, so I was really looking forward to this game. His list was primarily built around points preservation and trying to goad opponents into his big ghoulstar, so I knew big points would be difficult in this game. From his side of the table, my divination and quicksilver lash would prevent him getting too aggressive with the punchy quick moving elements of his list. After a few cagey drops, I dropped everything for first turn wanting to zone his advance to prevent him from pushing into the mid table uncontested. …Evana knew to be cautious around the living dead. The teeming masses of uncoordinated zombies and ghouls before her may look like easy prey for her disciplined troops but the necromantic magics of the two vampires leading them could greatly enhance their combat prowess. …her plan was working perfectly, the bulk of her forces were holding the undead center and monsters at bay. 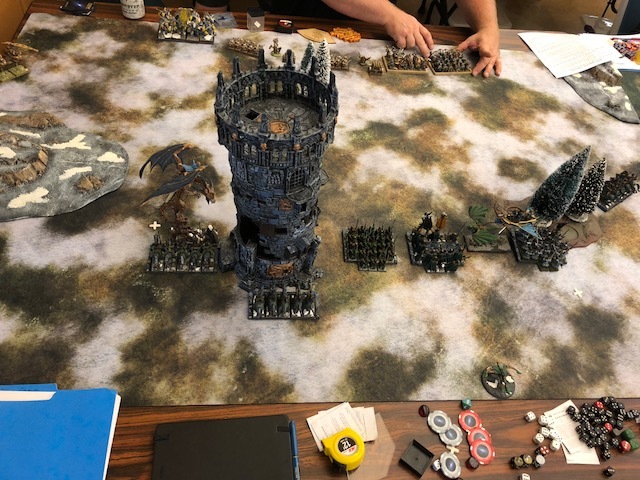 In the meanwhile her right flank were using the cover of the tower to surround a unit of vampire cavalry and effect the breakthrough she needed. …the leader of her Watchers signaled once and then withdrew a dozen paces as the horde of ghouls scrambled closer. As the first rank of the slavering cannibals hit the traps they simply disappeared, deep into pits or staked ditches, the second rank were shredded by a hail of razor thin metal disks. 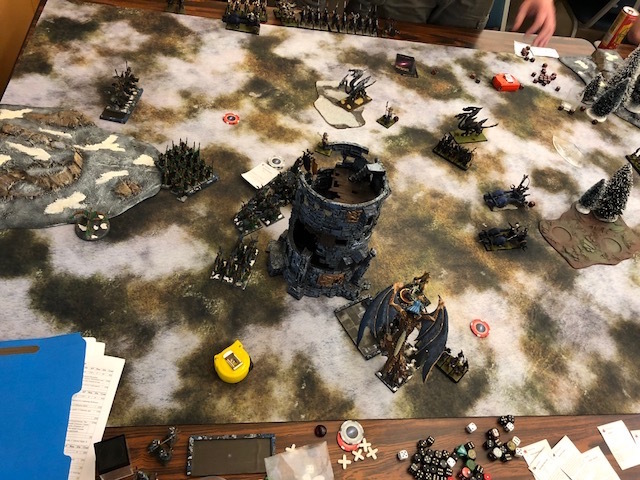 Watching his horde dissolve the vampire leading them from the gilded throne slitted eyes narrowed and the hulking varkolak surged forward unnatural will urging the monstrosity to break the line. Evans gathered her magics and unleashed a hail of energy bolts, dealing several mortal wounds and staggering the beast. This was a very close game, a 10-10 on points led to a 13-7 to me after objective. The team overall had a fairly good showing, with a big win and a couple of small wins, we weren’t quite at cap, but close. This game was a very tactical one, neither of us wanted to give the other the advantage and go down with a big loss. 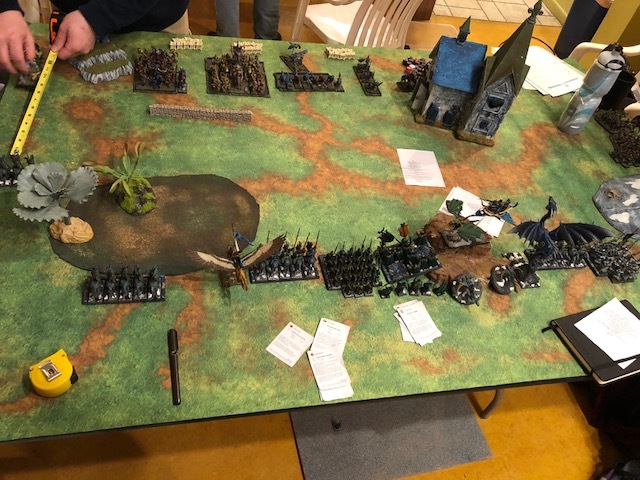 I think my opponent could have been more aggressive with his ghoul horde, while I should have been more aggressive on my right flank. 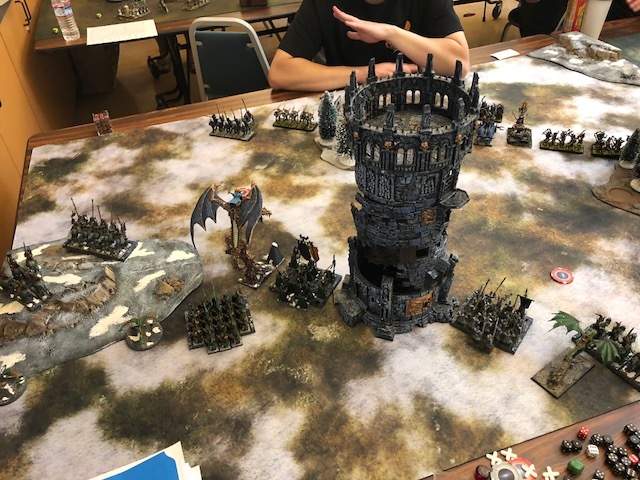 Only a cheeky ravenswing in the bottom of the turn got me that objective. 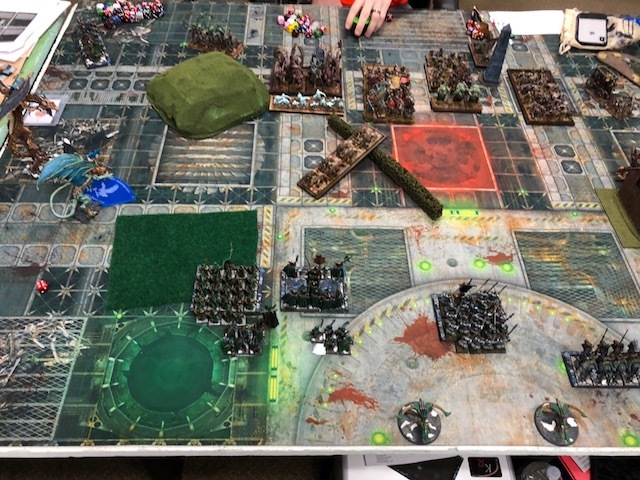 However, we only made it to turn 4, had we managed to play it out things would have been interesting as I’d pincered his cowboy/vamp knights with the frosty, sloop and blue spears and my green spears had almost chewed through the big zombie brick while his varko was nearly re-dead. I could have potentially cleaned up his entire army but the ghoul star if I’d had the remaining two turns. Another great Infernal Zoo in Davis, CA. Kudos to Alex for throwing a consistently great tournament. I really liked that we had a pairings video to get the hype going an with the strongest turnout since the death of the game that was our local community feels like we have a lot of momentum. So, how did the intrepid egg hunters do? ·My goal was to podium overall, so I fell just short. 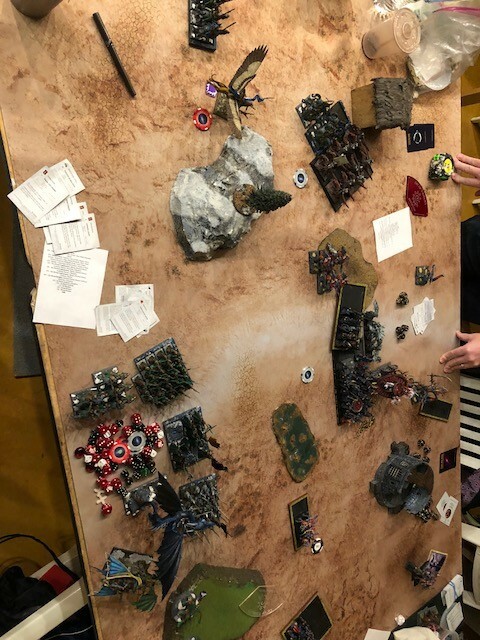 Looking back at Turn 5 of Game 5, I left the points on the table right there to achieve my goal. He did the job I needed him to do and I actually really like the build being able to fit in a 2+ and the Talisman. In contrast to my Buckeye list, his role as a magic user was much more subdued with the Master on Div/Pyro hogging most of the dice. I actually think this is a pretty points efficient complement to the list and I liked that he turned the Wardens into a real blender unit. However, he suffers from being infantry and is actually not that well defended. I don’t think I made a single 4++ save all tourney with him, but he only died once. I’m not sure you’ll see him again, but combining him with the MoCT prince seems fairly cost efficient. I liked this model a lot, I haven’t played much with Pyro or Divination and they were huge in many games. I took Pyro 4 times and Divination once. However, the combat ability of the dragon did not play a huge role (did not see combat in 3/5 games). I think I can achieve the same role for almost 200 pts less by putting him on a YD w Death Cheater. 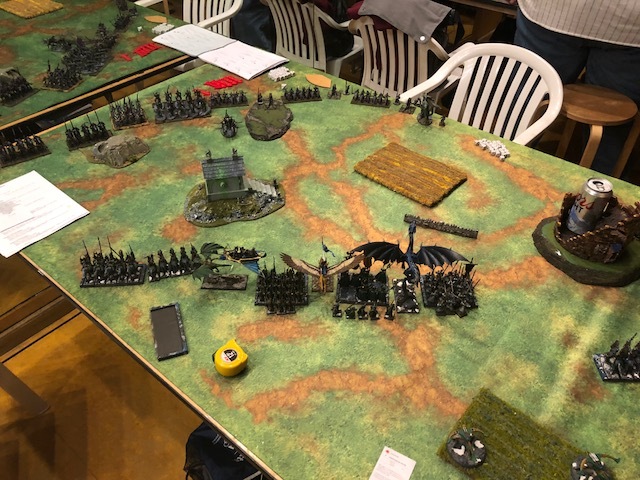 I’m giving this core set up an A- because I found it to be extremely points efficient, good scoring, plenty of bodies, the chaff I needed…I liked it a lot. Backed with flaming swords/awaken combo and rending banner they have the flexibility to fight up and down the spectrum of opponents and deliver solid output. I was really impressed with these guys. 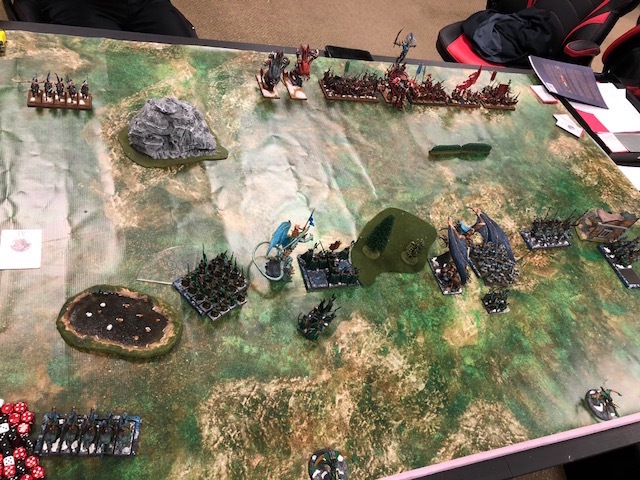 They took on some tough opponents and ended up killing two demigryphs, a blood chariot, two raptor chariots, two gyrocopters, a unit of marksmen and a kraken and I only lost them once. I will likely go for 2 units of these in future lists when able to. A relatively good set up, it ended up feeling a bit light as compared to 3 SGRs and its more expensive by 85 points. I liked the sloop, but it’s fairly fragile and (partially due to poor rolling) I felt it’s combat/zoning threat is more of a bluff than anything else and it died frequently. What can I say, I feel this unit is a fixture in my lists. Synergizes great with my magic, loved the addition of the Spear Prince to dial their damage output up. I really wish they synergized better with the hereditary, but it’s a small price to pay for their durability. I really liked this as a step in the evolution of the OotFH list I’d been playing for the first 9 months of the year. Not all of the new elements are must-haves for me and I’ve already moved onto a new list that I’ve been working on. I’m not upset with the overall outcome, my strength of schedule was very high, after the first game all 4 of my remaining opponents ended up in the top 8 and more importantly I got 5 great games in against some high quality opposition. However, I’m really excited about the .205 updates for the HBE book, I haven’t gotten a game in yet, will likely wait a couple weeks to finish out the last of the .204 games I have planned. 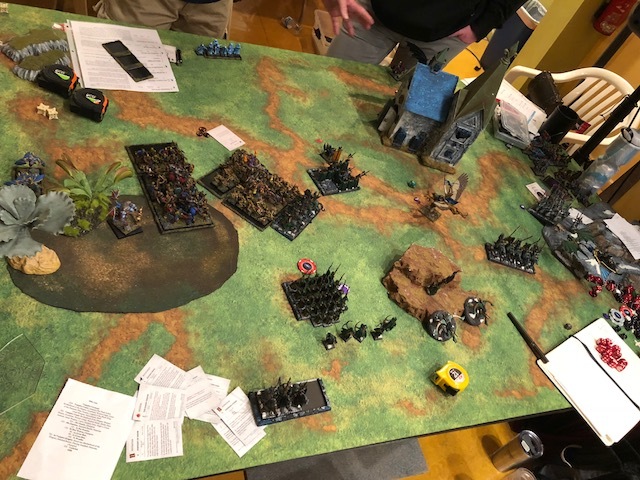 I’ve built a couple of lists and I’m seeing some really cool core and character set ups that I want to take for a spin, should be a fun holiday season of gaming (fortunately my wife doesn’t read this!). 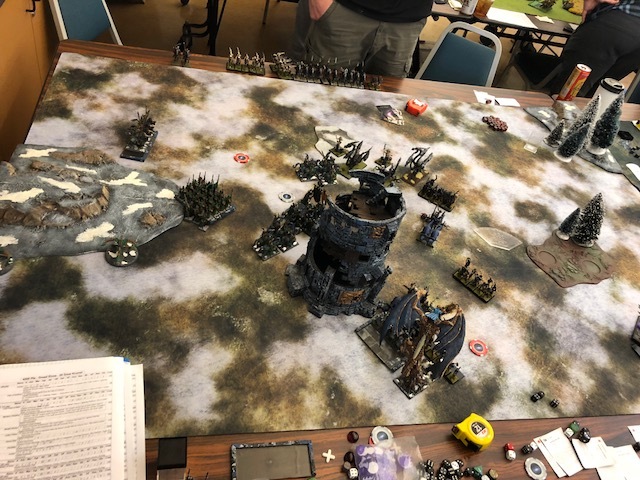 With a medium win in Game 4 I was within striking distance of the top spots and with a feeling of déjà vu stepped up to the same table from Game 4 fighting an army that was virtually identical to the one I faced in Game 3 generaled by my clubmate Drew. 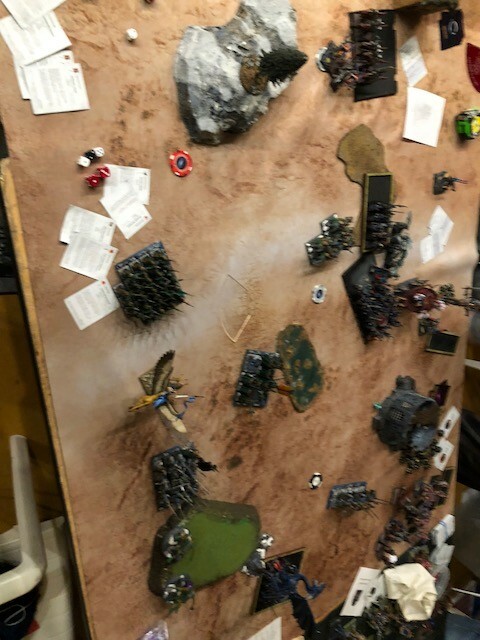 I felt like I had the tools to deal with this list, pyro was going to be huge as there was circa 1k points in 25 wounds of low save fast cav. However, the kraken and Divine Altar BSB were a real threat to my dragon along with the acolytes breath weapon so he had the tools to deal with some of my critical elements. I felt like this was a yellow/green match up for me. Movement: I saw no reason to be aggressive, I had a good defensive position I moved up slightly on both flanks and threatened charges. Movement: My opponent moves up giving me long charges, trying to tempt me out of my defensive position. I’ve been trying to take down the acolyte champion and am again unsuccessful. 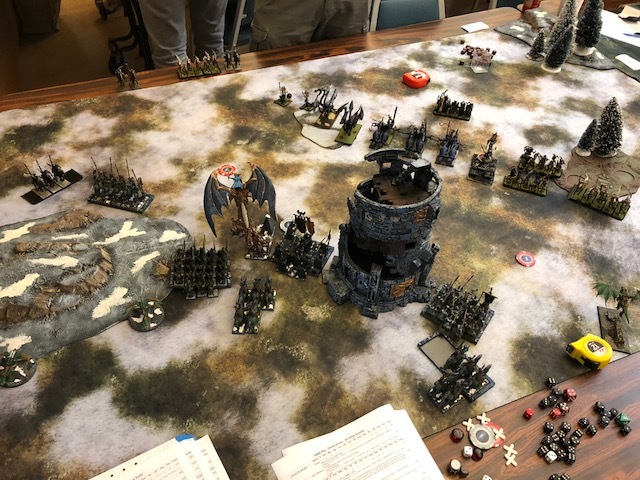 Yvraine felt the customary shivers run up and down her spine as Eingana swept through the Veil, banking they circled the clearing at the base of the mountain as her troops continued to pass through the Veil and form up into defensive posture. With all in order and a moment to collect her thoughts Yvraine reflected on the events of the past three days. Their easy victory over the humans had allowed her forces to arrive at the nest before any other corporeal egg hunters…but not before the scions of Vanaadra. The Wrath demons had absconded with the precious eggs and were already withdrawing their forces with their prize when the Sea Dragon Host arrived. Deep in the volcanic underbelly of the mountain her forces had matched blades with the hellish hosts. Her magics had carried the day blasting a fearsome Scourge from the sky as her bolt throwers skewered a foul winged Prince. 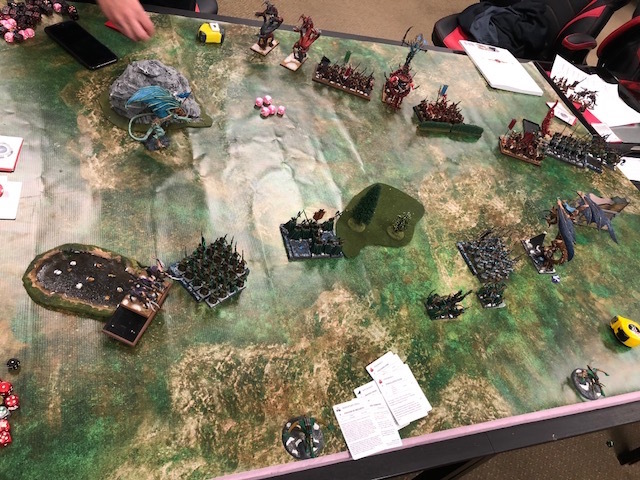 Leaderless, the hordes of Wrath had lost their advantage giving Yvraine time to effect a withdrawl, the dragon eggs safely in her saddle bags. As the last of her Spearelves emerged from the Veil a dust plume on the horizon caught her eye, with an unspoken word Eingana strove higher into the air, eyes narrowed on the growing cloud. 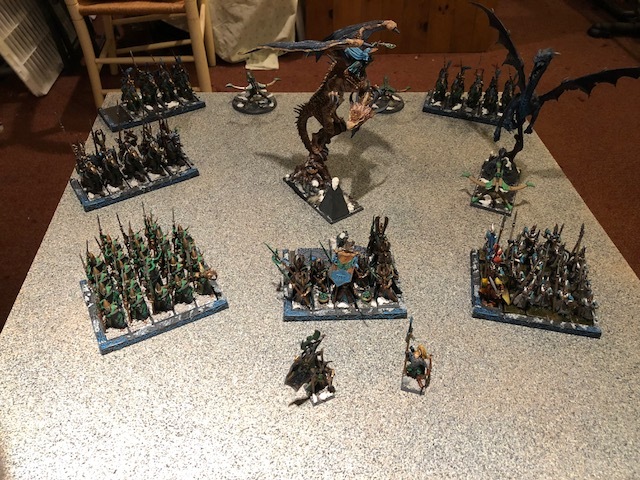 The sun glinted off wickedly curved scythes as a squadron of chariots crested the rise…Dread Elves! 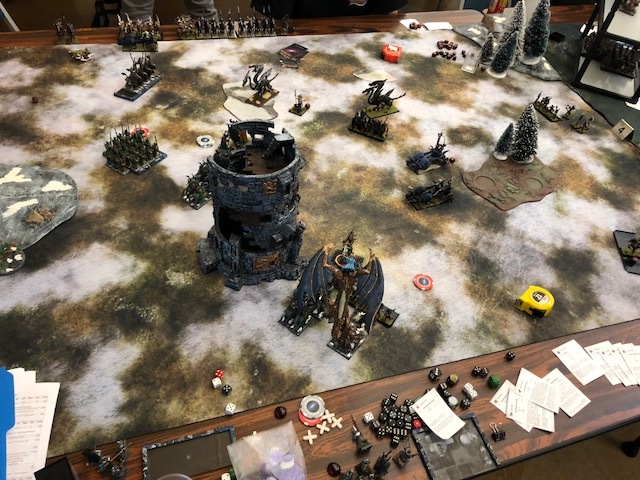 Yvraine examined her options and crystalized a plan as she guided Eingana back to the mountainside, she knew her forces could not face a third army in as many days. They would have to withdraw into the mountain and take their chances with whatever inhabitants it held, after quick council with her brother they agreed. Yvraine would wipe out the fast moving elements of the Dread Elf force while her forces withdrew into the rock. Her brother and his Wardens would hold the tunnel entrance while she scorched the Dread Elves and cover her escape into the mountain. At that point the entrance would be collapsed to protect their retreat. 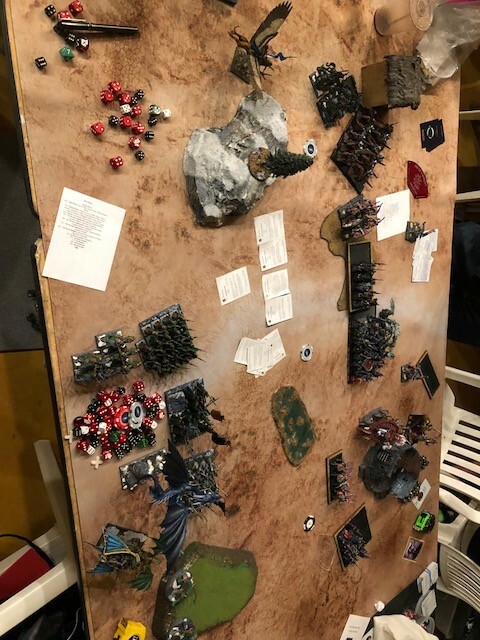 Alright, so after two big wins and a stinging loss on Day 1, I had dropped down the tables to table 4/5 and was hoping for a bit of an easier match up. 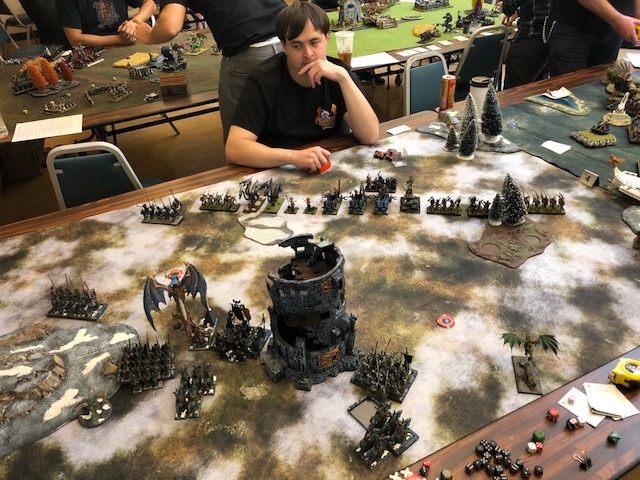 Originally, I had been matched against a very similar EoS list to my first opponent, but when Day 2 dawned it turned out I was up against Joe and his Dwarven Holds. Whew, double entrenched rune crafted organ guns with Engineers. 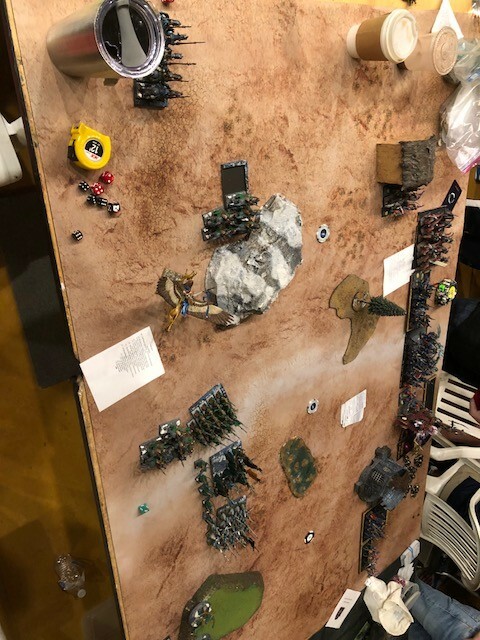 These machines were going to be almost impossible to kill from ranged with my shooting and could give pretty much any unit in my army a really bad time. Fortunately, they make up almost 25% of his army so the rest is not super scary, the Deep Watch block is small, there is no killer King, etc. Though the 8 Hold Guardians outmatch my combat units/dragon, they are slow and hard to maneuver. 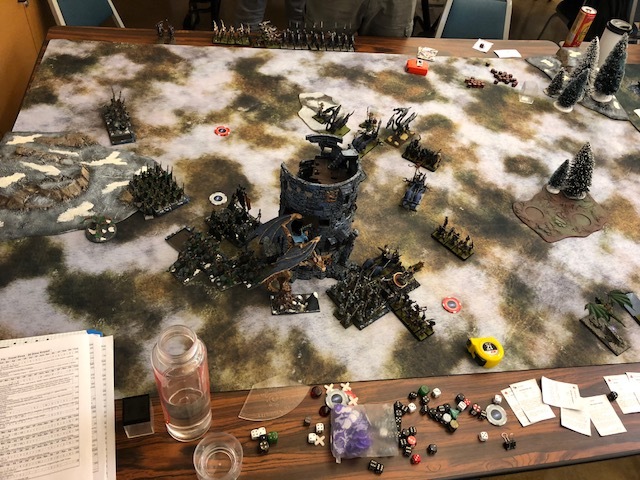 I needed to decide at the deployment phase whether I was going to push and try to take down the organ guns…after looking at the terrain and the scenario, I decided to push.